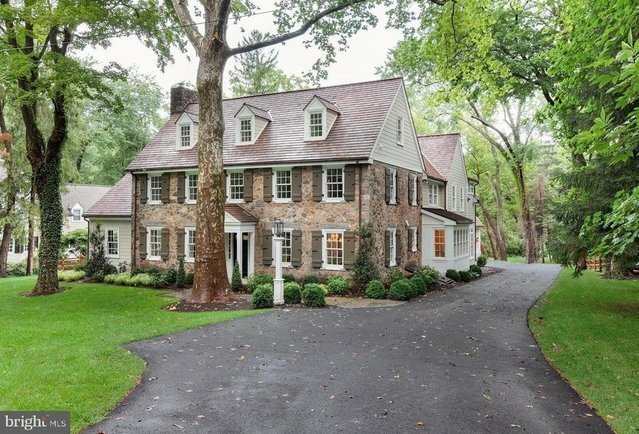 This fabulously renovated and expanded 5300+ sq ft stone colonial home is situated in a quiet sought after established Villanova neighborhood. It features five bedrooms, four full baths and a half bath in the main house. The center hall invites you to a formal living room with a large wood burning fireplace, ceiling beams and extensive trim. From the living room there is access to a den/study with vaulted ceiling and custom built ins. Formal dining room appointed with wainscoting and provides access to the gourmet kitchen designed with custom cabinets, marble counter tops, subzero and wolf appliances. An extensive marble top island, farmhouse sink and custom built in window seat accents this space. Great room with coffered ceilings at 11 feet, gas fireplace and random width wood flooring. An extensive master suite added featuring large walk in closet, bath with marble floors, vanities with marble tops, soaking tub, steam shower and privacy provided by pocket doors. Private balcony access through french doors in the master with views of the property. Additional two bedrooms each with baths and the laundry room complete the second floor. Third floor with two additional bedrooms and bath. Lower level accessed from great room offers additional space that can be finished. Outside amenities include a brick breezeway leading to a two car detached garage and pool house with half bath, changing room and outside shower. Garage's walk up second story accesses additional square footage also prime for finishing or storage. Flagstone patio and in ground pool for enjoying the outdoors. Renovation included new cedar shake roof, windows, new heating/AC system, plumbing and electrical systems. Home with low taxes and in close proximity to fine dining, shopping and easy access to major highways or the train for commuting.